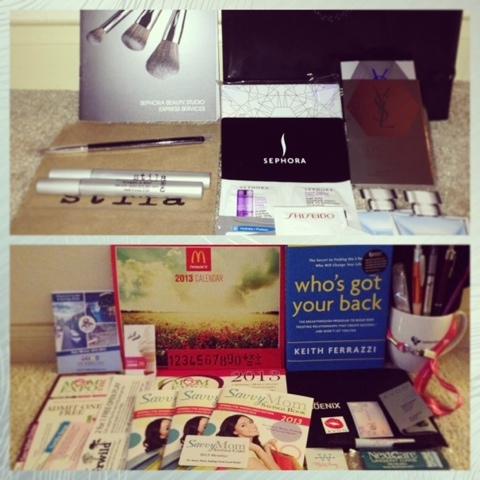 #Wordless Wednesday: Mom Expo Goodies!! Last weekend was a busy one for us. Hubby was gone and I had a baby shower to cohost. Friday night was spent between my daughter and assembling the shower decor. Saturday morning was the baby shower, after which we headed straight for the mom expo. A mom expo is essentially a trade show, with booths, events and info geared towards moms. We had a blast! Here's a pic of the sorted goodies we can home with. A full post about what went on at the expo will be posted soon. Stay tuned!